As an introduction, Lunar Legend for GBA is a remake of a game that had been Lunar: The Silver Star for Sega CD, Lunar: Silver Star Story for Sega Saturn, and Lunar: Silver Star Story Complete for Playstation. I haven't, however, ever had the opportunity to play any of these games, and don't really know too much about them aside from the fact that they exist and have a relation to this game. Specifically, anyone who has played those games and is looking to this review as a comparison to any of those games, to see how this has changed since those, whether this is worth getting if one has already played those, or whether to check this out over those, this review won't be able to help on those things. This review is basically just a review of this single game, pretty much as if those other games didn't exist, since that's my only experience with this game, as the GBA version only. So, for anyone just interested in finding out about this version of the game, that's what this review is for. Lunar Legend follows the adventures of Alex and a group of fellow adventurers on Alex's quest to become a Dragon Master in the footsteps of his hero, Dyne. Of course, as with any quest, things are never as simple as that, and the group ends up getting into something much more involved than just that. Alex will be joined in his quest by his childhood friend Luna, and a group of other people he meets along his adventure. They will experience many hardships and difficulties, but, they will stick together and work things through just like a good group of people does, until finally taking care of everything that needs to be done. The basic story itself really isn't anything too wild or different, as it does come down to a typical "save the world" sort of thing, but, there are a couple of twists and surprises along the way which will keep things interesting. 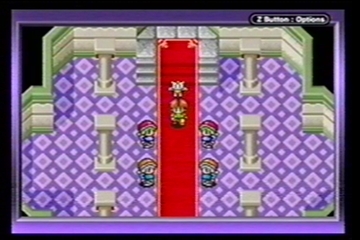 The gameplay is a fairly standard RPG setup. When walking around outside of towns, the group will randomly encounter enemies. When that happens, they will enter into a battle, and fighting will take place in a turn-based manner, using weapons, spells and items. For anyone who has played most any other RPG before, this should all be very familiar, and there isn't too much in the core of that which is going to be anything particularly new or different. From battles the group gains experience and levels, resulting in increased statistics and new spells and such like that. The money won from battles which can be used to purchase weapons, armor and items. Aside from the outside areas where the enemies are, there's also various main map screens, where one can select different areas to go to, and later on in the game one will get an item which will allow the group to go to any area by using that. Of course, in order to be able to go to an area the group has to make their way to that area first, which again involves the usual making their way through previous areas and doing various things which will result in the group going to that new area. The group by the end of the game will consist of five characters, but, those characters will join along the course of the adventure, and, at various points people will also leave the party. This is occasionally annoying at the beginning of the game, as sometimes it's uncertain whether a character is really going to be staying or not, or whether they'll leave and come back, and there's a decent amount of adjusting that needs to be made as the group changes. There are, unfortunately, a few issues or things that might be desired to be different about the game. Battles aren't always particularly smooth, and there are a number of aspects in which they could have been better. One thing is, if there are a couple of monsters on the screen at once, and one directs all the characters to attack the same one, when that one enemy has been defeated, the rest of the characters who had been told to attack that one will just attack random other enemies on the screen. This can be annoying if, for example, one has four people in the group, and there are three enemies on the screen who take two hits to kill. If one has all four attack the same enemy, and it dies from the first two hits, instead of the other two characters attacking the same enemy to kill it, although that may happen, there's also the chance that they each might attack different ones, leaving both enemies alive. Of course, the way to avoid this would be to realize how many attacks the enemies will take to kill at the beginning of the battle, tell two to attack one enemy, and then tell the other two to attack a different enemy and that solves the problem. Still, it doesn't really seem it's something that should have been necessary. Granted, this is a situation which has existed in many other RPGs, but, again, just seems like something that could have been adjusted and handled better. Another problem with battle is that, there is also an option for fighting in the battle to take place automatically, with the game choosing the enemies to attack. The benefit of this is it means one doesn't have to do all of the button pressing to get through a battle. The downside is that the auto attacking is similarly unintelligent. Again, if there are three people in the group, and two enemies, and if each enemy takes three hits to kill, it may very well have two attack one enemy and the third attack another, leaving both enemies alive. Another annoying thing about the auto attack is that it's the first option on the attacking screen. If one moves the cursor over and chooses manual attack it will automatically go to that for any following battles but, if one turns the game off and back on, the cursor will default back to the auto attack. Once an auto attack has started, one can press B to cancel it, but, even if one does that right away, it will still go through a full round of attacking before allowing you to take over control of the attacking. So, this again leaves much to be desired. Later on in the game when one is strong enough to defeat most groups of enemies without problem (which will happen as the game isn't too high on difficulty later on), one might still just choose to leave auto attack on anyway as, even if it's not doing a very good job of it, it'll still defeat most enemies without too much problem. This, while more convenient, also results in most of the random battles toward the end of the game being rather boring. On the other hand, these issues with the battles aren't anything too unexpected or problematic, they're just things that could have been different, and would've made for a better experience with battles if they had been. Everything to this point, really, has been fairly standard RPG stuff, and not too significantly different from any other RPG that one may choose to pick up. It all works well enough, but, nothing that really jumps out from all of that previous stuff. The thing that really makes this game stand apart from other RPGs is the level of character interaction. When going around talking to NPCs in towns, it's not simply listening to that character deliver a monologue over and over. When talking to an NPC, not only will they talk to you, but various characters in the group will often converse back with them. After having a discussion with that NPC, what they say will often change to reflect the discussion that they previously had with you. As well, after something significant happens, most all of the NPCs will then have new things to say to reflect on what has happened, as opposed to just carrying on with their set lines as if nothing had happened. Even while going through non-town areas, the characters within the group will often have discussions among themselves, commenting on the various things that are happening. All of this interaction not only makes things very interesting, but makes it enjoyable to go back through areas after having done something and see what has changed in what people will say. Really, the interaction and exploration are the main draw of this game. As mentioned above, all the characters to talk with, and the different reactions they give, are just as interesting as anything else. As well, many of the characters are very memorable, not just random people wandering around. 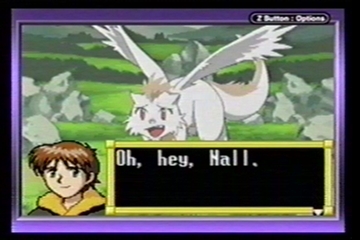 The game also has an interesting method of presenting some characters where, the first time you talk to them, you'll get a close-up picture view of the character intended to give you a good mental image of that character, to go along with the on-screen sprite and the text. As well as talking to the characters, just going around and exploring all of the towns, making sure you've found everything there is to see, can provide a very interesting challenge. There's a great deal to do in this game beyond just fighting enemies. When one is outside of the towns and in areas with enemies, exploration there is also very interesting, with a number of different locations, each with their own unique feel and style to be explored. All of this is what sets this game apart from just being another standard RPG, which on its own it does a very good job of the things one would expect. Beyond that though, it's the character interaction, the dialog, the story and the exploration which really are the draw to this game. It's a very enjoyable adventure, and, being available in handheld form, is one of the best portable RPGs available. It may not offer anything out of the ordinary as far as the basic foundation, but, for anyone who enjoys the central mechanics of an RPG, this game is definitely worth checking out for all the detail it has to offer.